Biosensors are finding increasing applications in different areas. Over the last few years the areas where biosensors may be used effectively has increased dramatically. This book like the previous four books on analyte-receptor binding and dissociation kinetics by this author addresses the often neglected area. The kinetics of binding and dissociation in solution to appropriate receptors immobilized on biosensor surfaces occurs under diffusional limitations on structured surfaces. The receptors immobilized on the biosensor surface contribute to the degree of heterogeneity on the sensor chip surface. 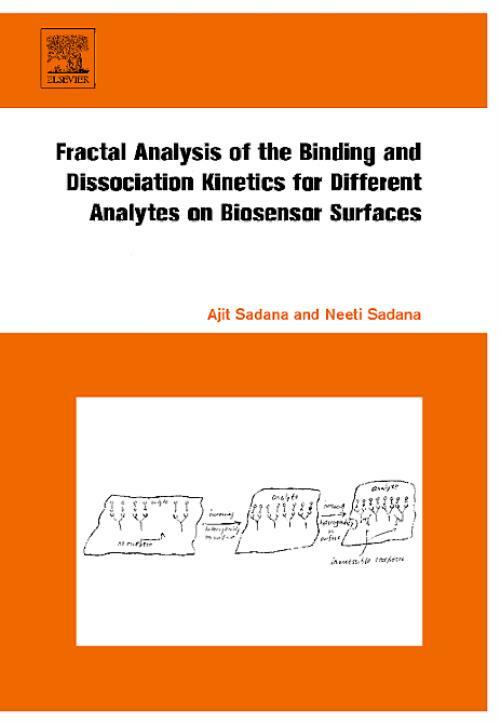 The fractal analysis examples presented throughout the book provide a convenient means to make quantitative the degree of heterogeneity present on the sensor surface, and relates it to the binding and dissociation rate coefficients. The fractal dimension is a quantitative measure of the degree of heterogeneity present on the biosensor surface. The book emphasizes medially-oriented examples. The detection of disease-related analytes is also emphasized. The intent being that if intractable and insidious diseases are detected earlier, they will be controlled better, eventually leading to a better prognosis. Chapter 3 is a new chapter that emphasizes enhancing the relevant biosensor performance parameters such as sensitivity, stability, selectivity, response time, etc. As usual, as done in previous books by this author, the last chapter provides an update of the economics involved in biosensors, and the difficulties encounters in starting-up a biosensor company. - Modelling of binding and dissociation kinetics of analyte-receptor reactions on biosensor surfaces: provides physical insights into these reactions occurring on biosensor surfaces. Very few researchers even attempt to analyze the kinetics of these types of reactions. - Fractal analysis used to model the binding and dissociation kinetics: original and unique approach. - Economic analysis provided in the last chapter: helps balance the book; besides providing much-needed information not available in the open literature. - Emphasis on improving biosensor performance parameters: helps make biosensors better. - Empahsis on medically-related analytes: helps in prognosis of diseases. Dr. Neeti Sadana is an Associate Professor and Section Chief at the University of Oklahoma.